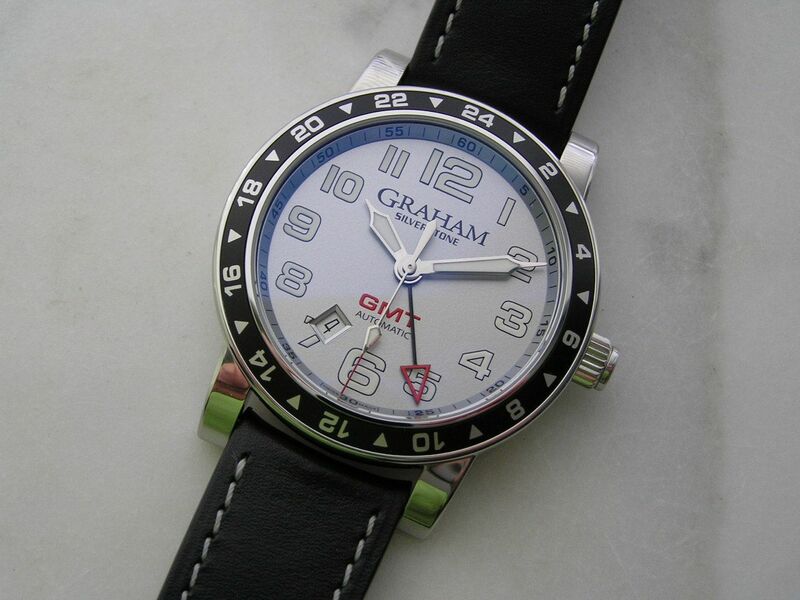 When I think of Graham brand watches, I usually envision absurdly large fighter style chronographs with oversized pushers and busy dials. They always seemed like clown watches to me. 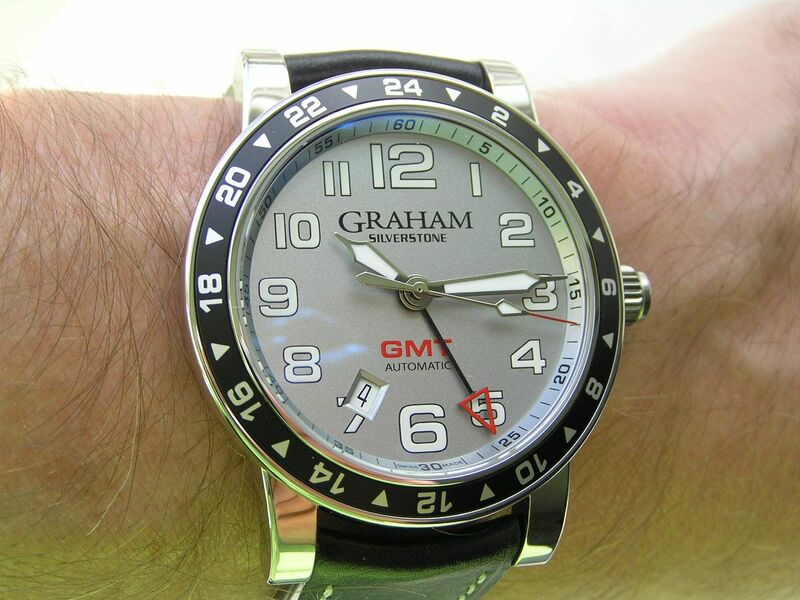 So when these Graham Silverstone GMT models started showing up on the grey market about a year ago at deeply discounted prices, my interest was piqued because, wonder of all wonders, this watch was ‘only’ 42mm in size! A sensibly sized Graham? Who knew! 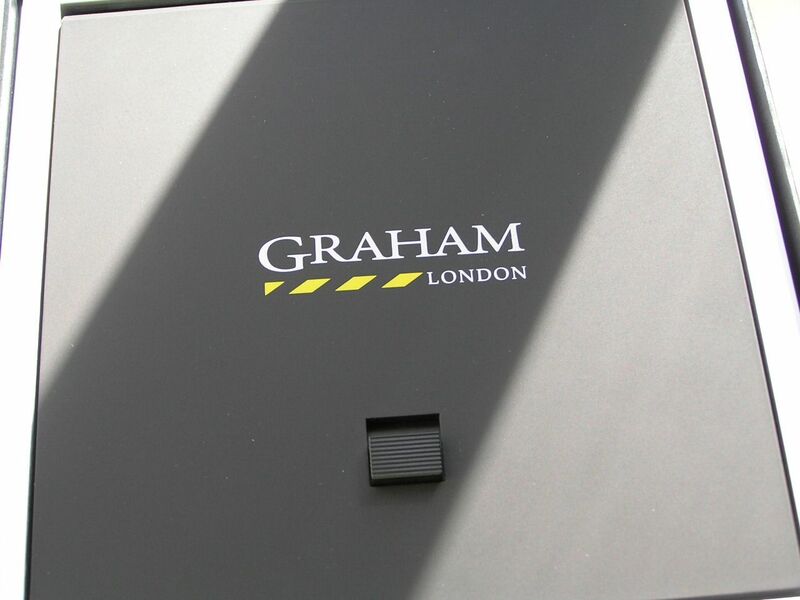 Graham is an English watch company playing off the history of George Graham, who in the early 1700s was a master clockmaker in London. 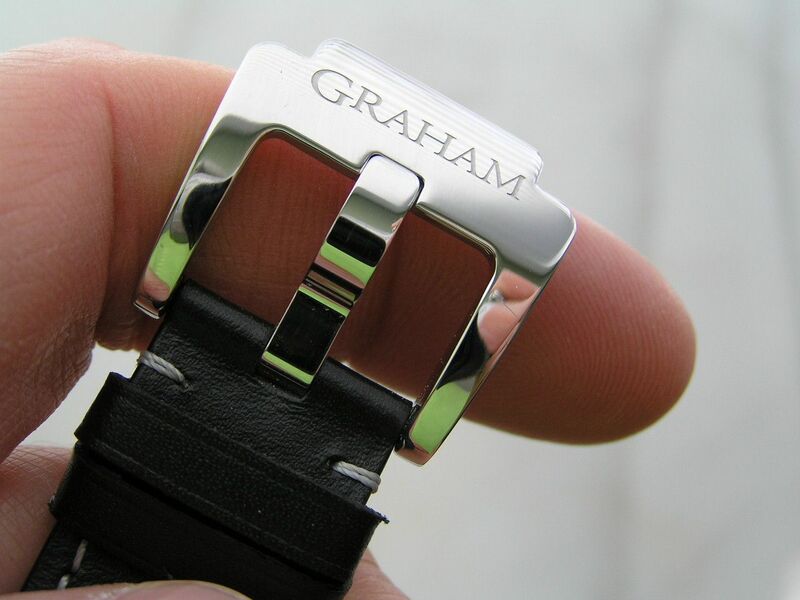 All Graham watches are Swiss Made and utilize the highest quality materials with thorough engineering incorporated into each watch they make. 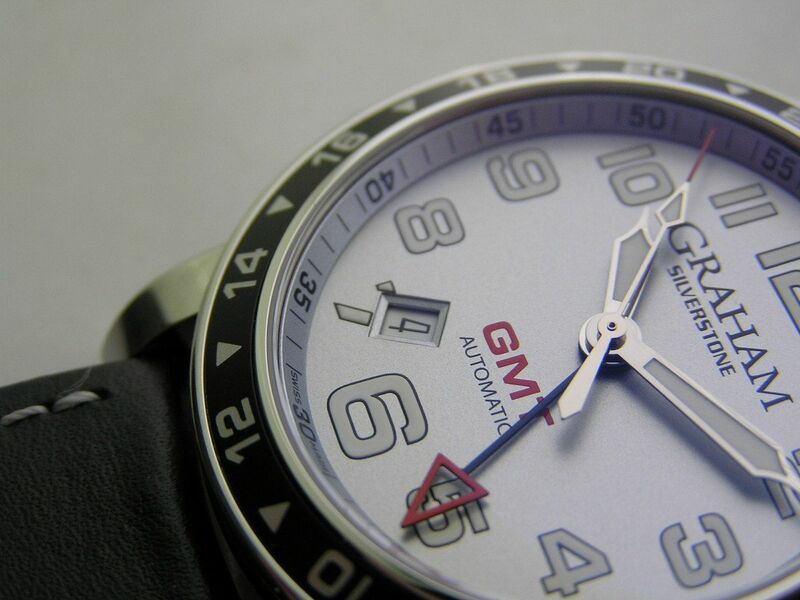 The Silverstone GMT gets its name from the famed Silverstone racetrack that hosted its first race in 1947 in England. In 1950, the first Formula One race was held at Silverstone. The track has since become known as the home of British racing and Graham saw fit to honor this grand dame of racetracks with a watch bearing its name. 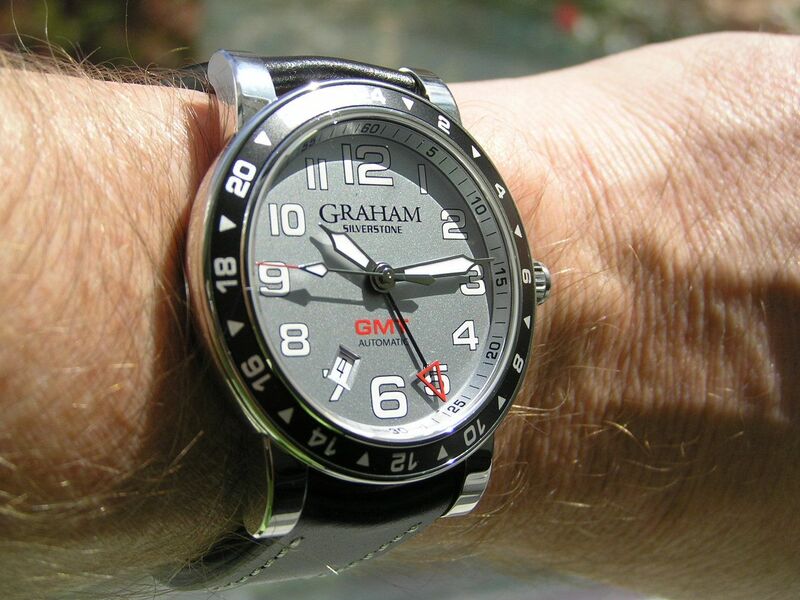 So of course, since I discovered I could get a Graham for one-third the retail price, I got me-self one and truth be told, I have been very impressed with this watch since day one. 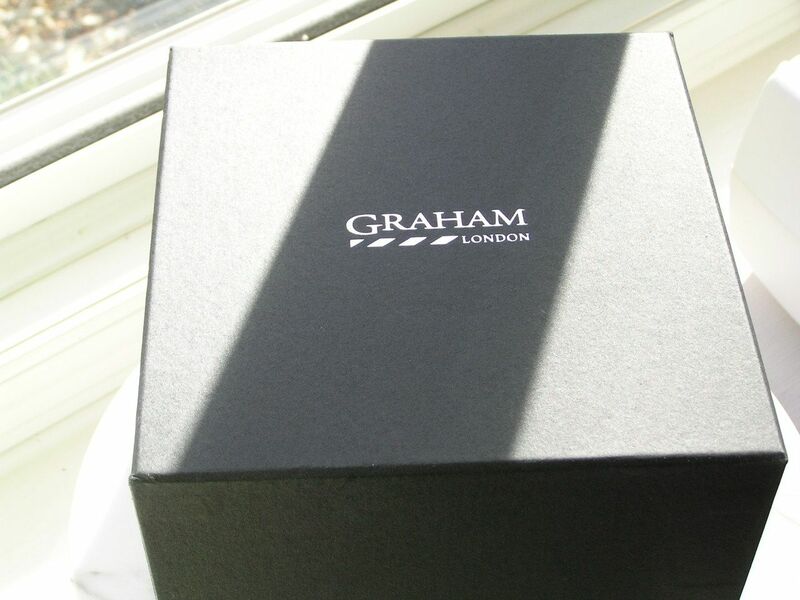 The overall quality, look and feel of this piece is superb and I wish and hope that Graham decides to make more watches in this size range. Currently, it looks like their smallest watch is about 44mm. 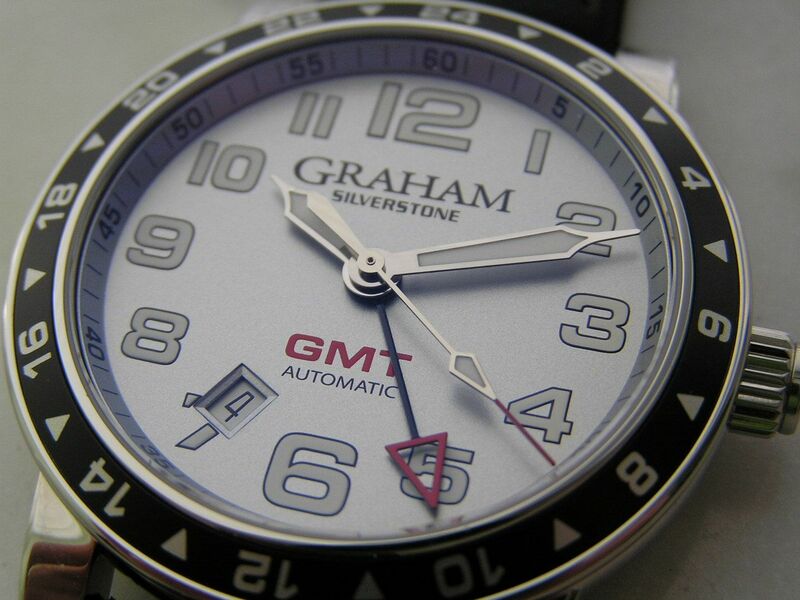 The Graham Silverstone GMT came in a black or silver dial; I chose the silver. The dial is a nice shade of silver that is surprisingly easy to read, but I’m getting ahead of myself. 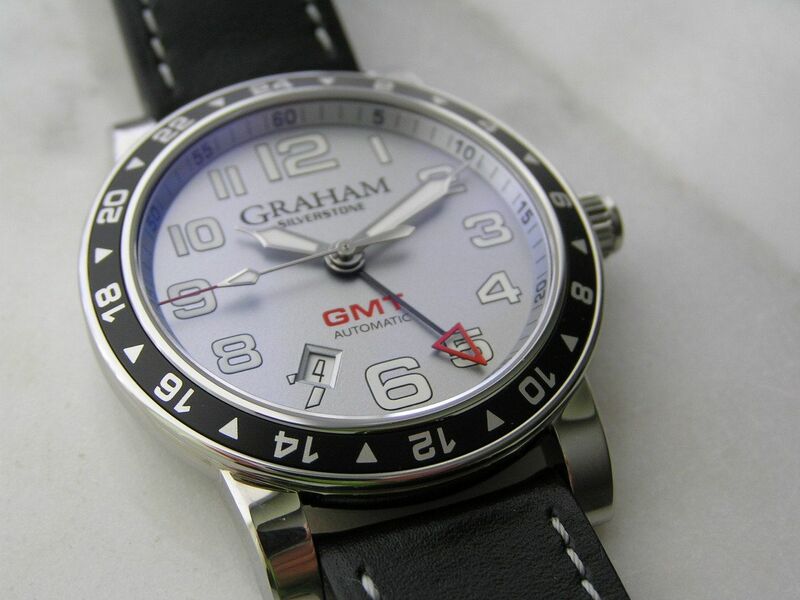 The Graham GMT starts with a beautifully fully polished stainless steel case that measures the aforementioned 42mm (actually 41.9mm) without the screwdown crown; 45.5mm with the crown included. 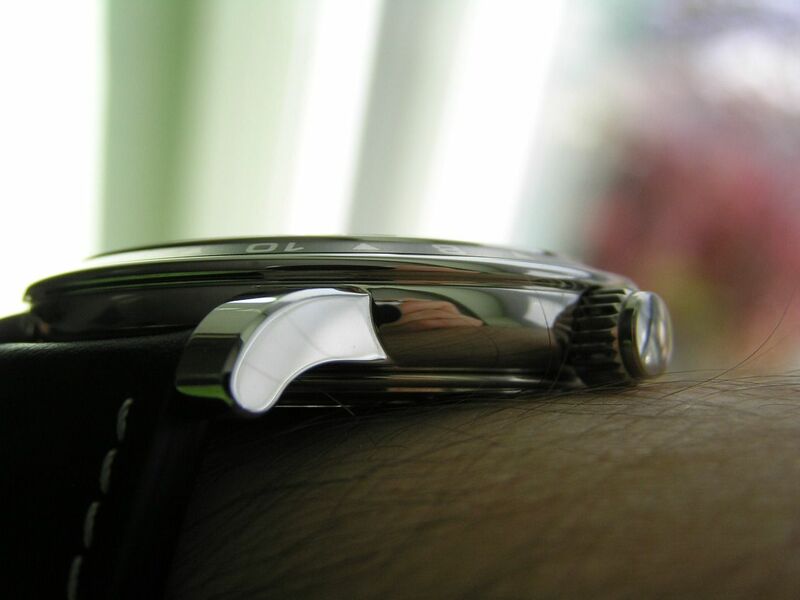 The case is shaped with a nice rounding to the case sides and nifty curved down lugs that help the watch hug the wrist. Believe me, they did not skimp in the manufacture of this case, although the screwdown crown is a curiosity for two reasons. Why on earth use a screwdown crown on a watch rated at only 50 meters of water resistance? Seems silly to me. Also, the crown is incredibly plain, it is not signed nor does it have any distinctive features, like a larger size, deep knurls, etc. I would have liked a nicely signed crown to compliment the unique look of this watch. 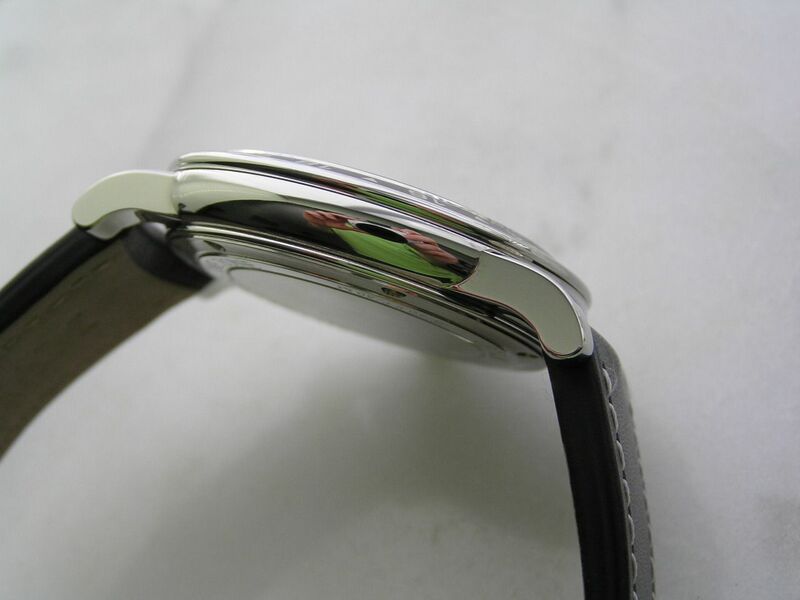 The caseback is brushed and polished stainless steel on the outer edge and is a display type held in place by 6 small screws. 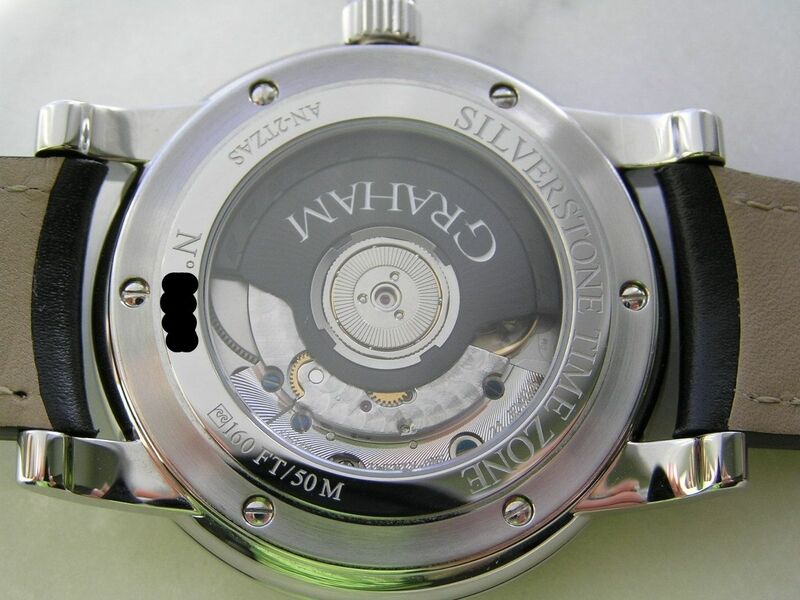 The very nicely finished movement is easily examined through the caseback with a totally cool signed black rotor. Case thickness is a svelte 10.7mm and lug spacing is 20mm. As just mentioned, the watch is factory rated for a modest 50 meters of water resistance. A fixed black 24 hour bezel insert surrounds the dial, a dial which does exhibit some of the traditional Graham excess, namely the somewhat oversized arabics and large pointer style GMT hand. But the excess is restrained and it actually works well while telling the world this is not your usual watch. The shade of silver on the dial is just about right, not too bright, and with the finely crafted hands with their thin pointed tips, this watch is easy to read. The seconds hand has a luminous pointer about two-thirds of the way out, with a long red tip after the pointer. It’s a nice long seconds hand, one that extends fully in the chapter ring that features small arabics every five minutes and minute markers between the arabics. 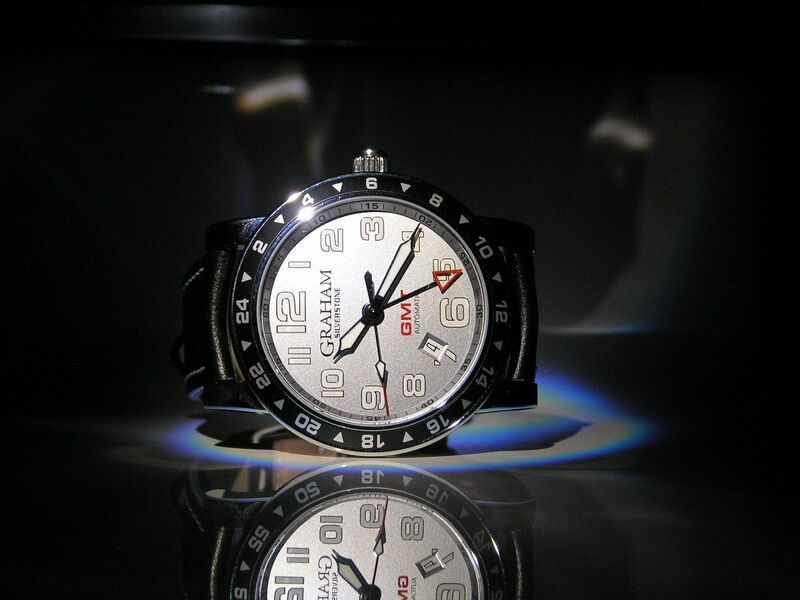 The large screened arabics on the dial look like they are luminous, but they are not. 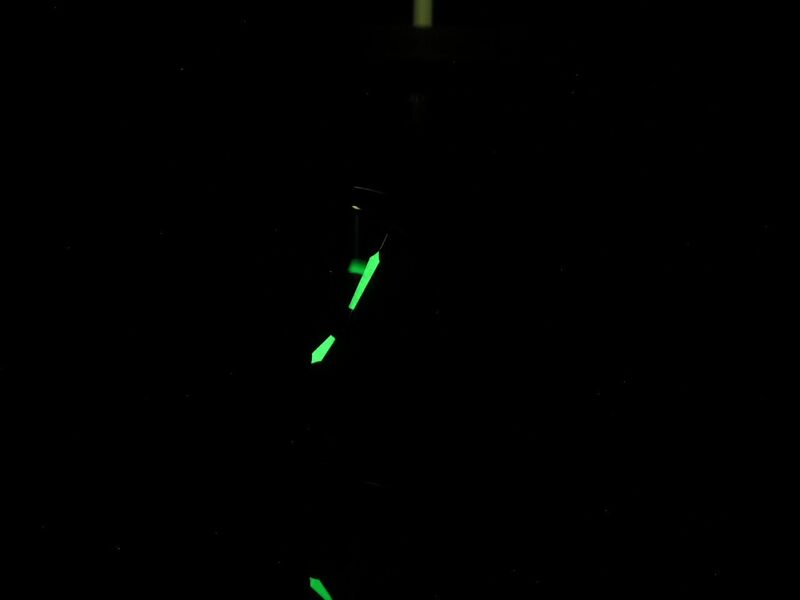 Only the hour, minute and seconds hand glow in the dark. Lume quality is good, but it would be nice to have some sort of lume on the dial, such as dots, markers, etc. While there is minimal printing on the dial, the texts are a bit large, but again, not too garish. 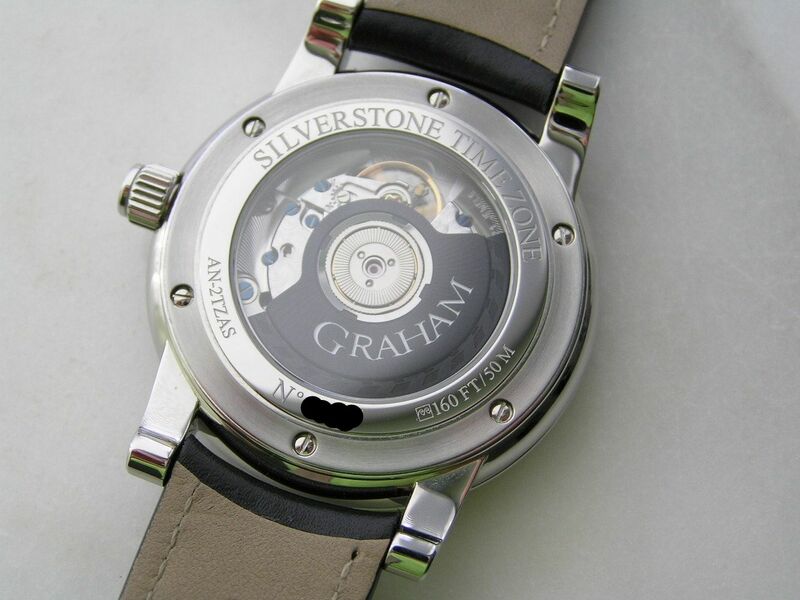 The name ‘Graham’ is prominently displayed under the 12, with a much smaller ‘Silverstone’ text underneath. Above the 6 position is a small ‘automatic’ with a large red ‘GMT’ above that. It might sound a bit loud, but it really isn’t. I’m not sure why they didn’t make the GMT hand luminous, perhaps because the bezel with the 24 hour markings is not luminous or maybe they don’t think you need second timezone tracking in the dark. Regardless of this somewhat odd oversight, the GMT hand is a plain black stick with an oversized open red pointer tip that is super easy to see. Again, daytime legibility is a strong point on this watch. 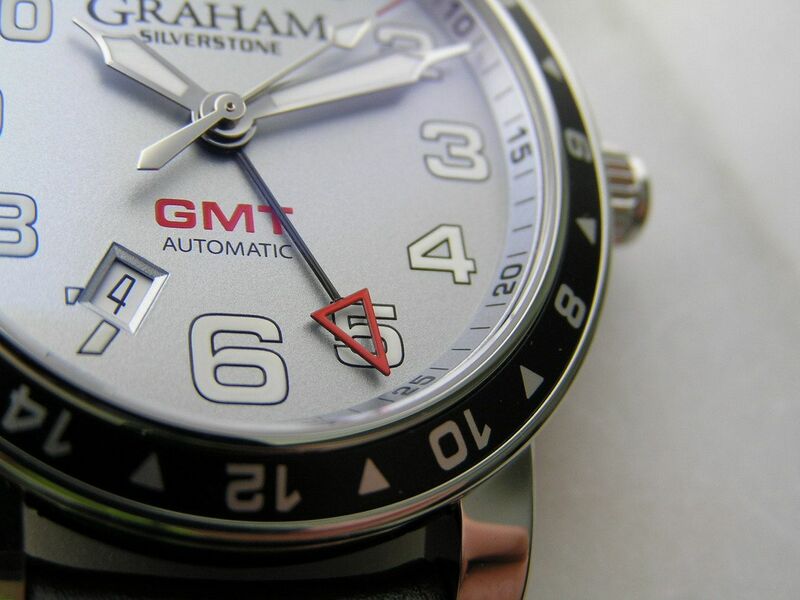 Another unique feature of the Graham GMT is the location of the date window. It’s at the unusual position of about 36 on the dial (or 7 o’clock depending on how you look at it). Not sure why they chose this position, but it does the job and works fine. The quickset date mechanism works well, the date wheel is black on white and is visible through the recessed window that frames the date nicely. 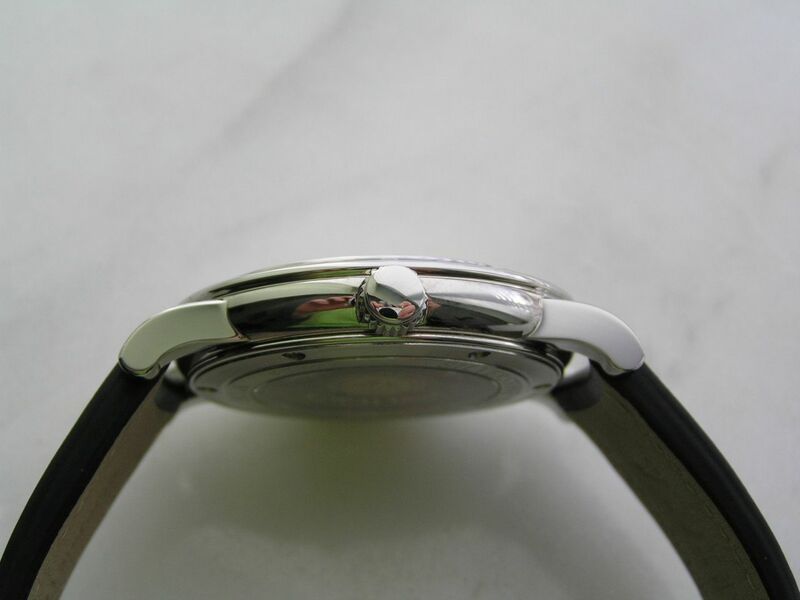 Capping the dial is a very slightly domed sapphire crystal with anti-reflective coating. The build quality of the dial and hands is very good; no defects or dirt were noticed under an 8X loupe exam. Doing duty inside the Graham Silverstone GMT is the venerable Swiss Made ETA 2893-2 automatic movement, with 21 jewels running at 28,800 bph with the GMT complication (Graham Caliber # G1714). This movement is the workhorse for most GMT automatics around and in this application, it’s treated to a nice decoration regime (perlage and blued screws) and the cool signed black rotor I mentioned earlier. It’s a joy to behold when viewed through the display caseback. The watch hacks and manually winds and the GMT hand clicks around the dial in one-hour increments. The watch winds and sets well and keeps time to a fine +4 seconds/24 hours according to my testing. Power reserve was clocked at a totally respectable 49.5 hours, more than the expected 42 hours. Excellent! 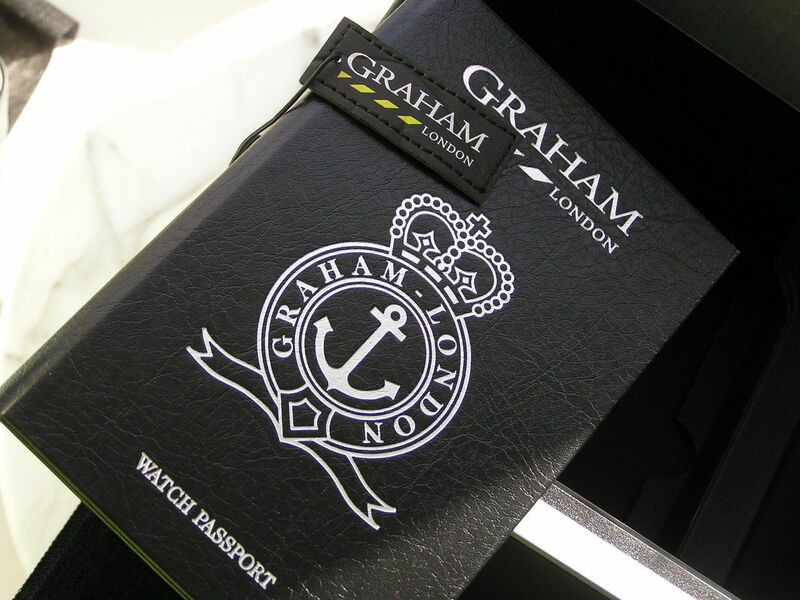 The Graham Silverstone GMT comes on a high quality black leather strap with white contrast stitching. 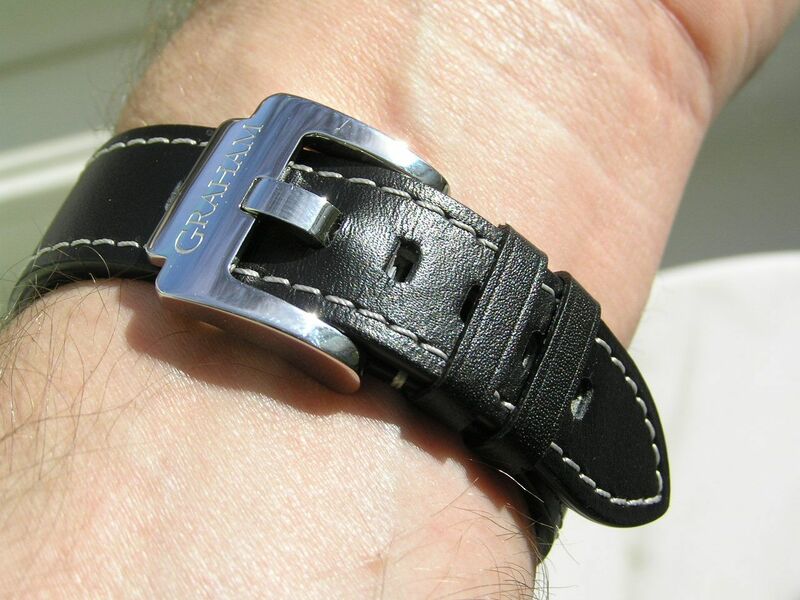 The strap is smooth leather and is signed, as is the highly polished stainless steel buckle. 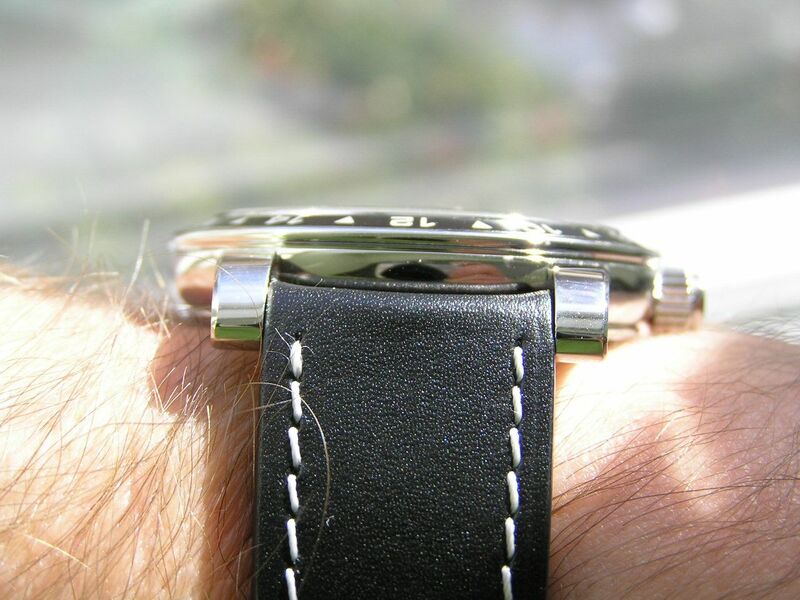 The strap measures 20mm at the lugs and tapers to 18.2mm at the buckle. There are two keepers, one fixed and one floating. The strap is a bit thick and mildly padded, but still soft and flexible. A perfect companion to the rest of the watch. Presentation is rather over-the-top, as would be expected of Graham. A two piece black cardboard outer box encloses another oversized outer box has a damped hinged auto-open cover (once the latch is slide back) with yet another smaller zippered box inside that actually contains the watch. The zippered box could be used as a travel box if needed. Full documentation in the form of a hardcover ‘watch passort’ is included. The passport contains hand-written serial numbers and movement numbers, which is a nice touch. No complaints with this presentation. 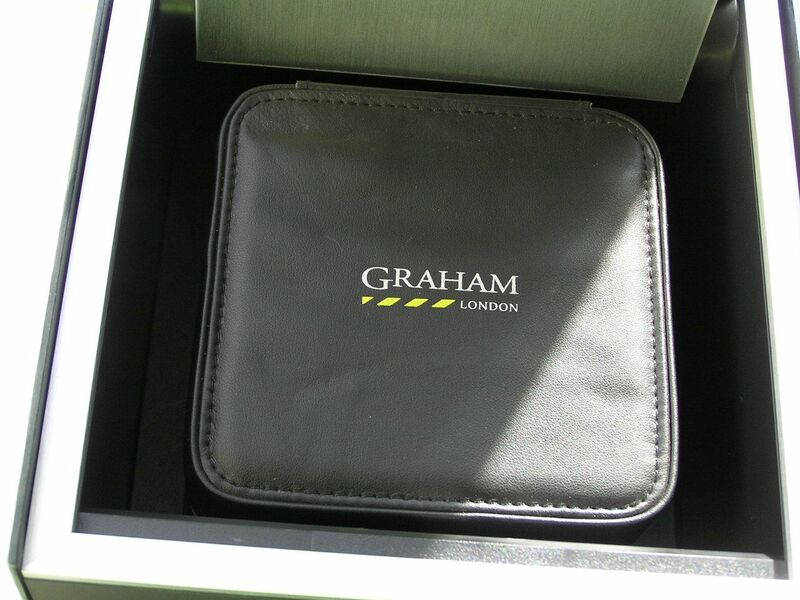 Often times a high priced watch from a smaller company like Graham will come off as either overdone or overstyled (which their Chronofighter models are, IMHO) or all flash and no substance. This Graham Silverstone GMT exceeded my expectations of what I thought it might be and has been a great introduction to this English brand. While I can safely say that I will probably never own an oversized overwrought Graham Chronofighter, if they produce more smaller sized watches like this Silverstone GMT, I would definitely take a look and have interest. 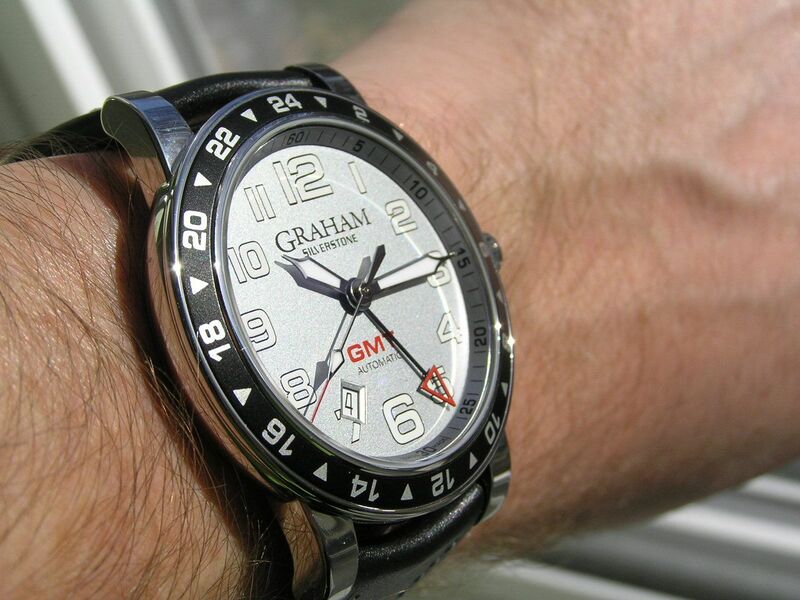 This Graham Silverstone GMT is a superb watch in most all respects and if you can snag one for one-third of retail, consider it well-bought. 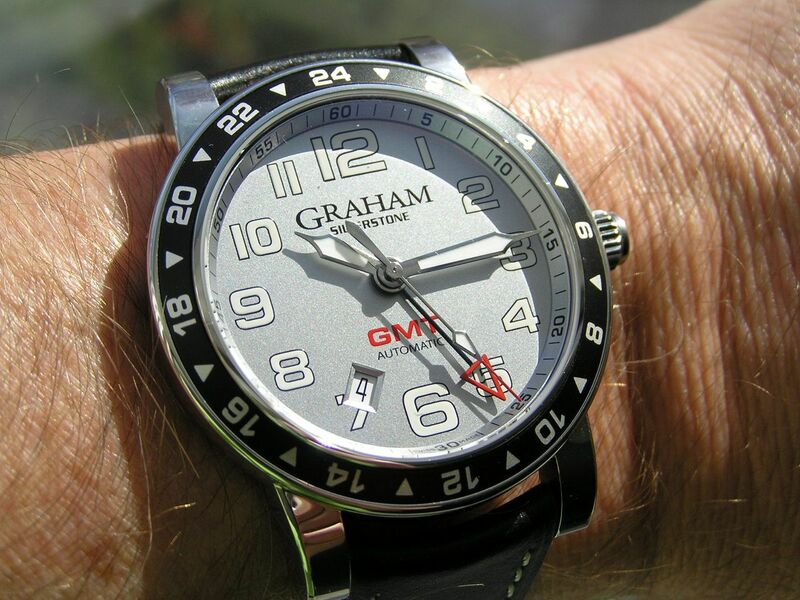 Verdict: the Graham Silverstone GMT gets the job done with outstanding style, functionality and unique details that set it apart from other GMT watches on the market; overall, a high-grade watch for discriminating collectors. Well done! I assume the date window @7 is much the same viewing angle as @4 but closer to the wearer and at the best angle to read. I too am puzzled by the screw down with such a low WR which seems pointless. The missing luminous markers males for difficult night reading and even one @12 as a top reference would have been useful. Nice watch, well made but lacking IMO on some basic points. Excellent review as always.